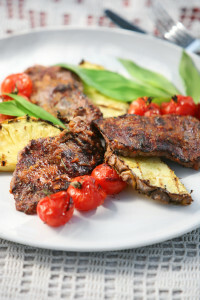 Grilled tri tip, tomatoes, and pineapple is a simple and beautiful way to enjoy a healthy and diabetic friendly dinner. To make the marinade, in a large bowl, combine the olive oil, cloves, cinnamon, honey and lime juice and whisk to blend. Set aside. Cut off the crown of leaves and the base of the pineapple. Stand the pineapple upright and, using a large, sharp knife, pare off the skin, cutting downward just below the surface in long, vertical strips. Cut off any remaining small brown “eyes” on the fruit. Stand the peeled pineapple upright and cut it in half lengthwise. Place each pineapple half cut-side down and cut it lengthwise into four long wedges; slice away the core. Cut roma tomatoes in half. Place the tomatoes and pineapple in the bowl with the marinade and stir to coat. Place Tri Tip on the grill over medium high heat. Cook for 20 min turning occasionally. Remove from grill set aside and rest while you cook the pineapple and tomatoes. Place on the grill and cook about 3 to 4 minutes, basting once or twice with the remaining marinade. Turn the fruit and move it to a cooler part of the grill or reduce the heat. Baste again with the marinade. Grill until the pineapple and tomatoes are tender, about 3 more minutes. Slice the steak against the grain, the meat should be rare to medium rare. Place meat slices back on the grill and cook to desired doneness. Remove everything from the grill and place on a platter or individual serving plates. Brush the pineapple and tomatoes with the rum, if using, and sprinkle with the lime zest. Serve with a colorful salad to increase the amount of vegetables in the meal as well as the visual appeal.